There's always something similar to Munich shows: It rains! It was a beautiful day yesterday when we all gathered before the gates long before showtime. Dieter Hoffmann told me he was waiting there from 10.00 in the morning. I did arrive around 3 pm., having flown in from Dortmund. Without my wife, because she and our daughter Nessa Nuisance were leaving that night for our flat in Spain. So I got an early flight and tried for the front area again. While we were waiting, the weather got real windy and dark and the opening of the gates was delayed and delayed, due to technical problems (they said). We heard the soundcheck, bits of Thief in the night and riffs from the end bit, but no proper songs were played. Gates opened close to 6 pm at last and then the other Munich problem struck again: Security. They are only there for you, that's what they tell you on their T-Shirts, but they sort of want to make the world a better place without anyone asking for it. What they did is keep everybody from running. You have the front gate, where youweren't let in when you pushed, then you have the second gate, where they controlled your tickets. I could run 30 m after that, when they had another entrance for the pitch, controlled every ticket again and only let people in one by one. On the stairs down to the pitch there were guards every ten steps or so that kept you from running. Down on the pitch I could run for another 50m, when there was another ring of guards and so on and so on. I crossed about 5-8 rings of guards to make it into the inner section, Keith side this time. It's a stupid thing to control a crowd, but it's the Munich way of doing it. The same with fireworks. Fireworks are not fireworks in Munich, they are little blobs and spits, that's all. The confetti machines for Brown Sugar had to be installed on top of the stage sound system, the end-firework was barely seen, and the one that goes off when the Stones have left was seen by nobody, as that took place on the ground behind the stage and they were not allowed to have that higher than 2 m or so. The rain set in right before the Hothouse Flowers were going on stage and what a bit of rain. Everything was drowned in a minute. 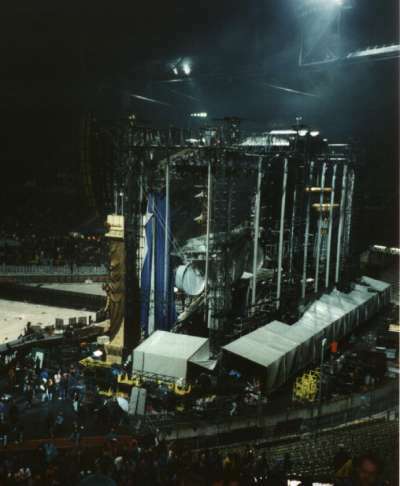 I had that once before in East-Berlin 1990, 2nd show, where the stage was nearly falling apart and of course in Munich 1982 and 1990 (1995 was different: I orderd pitch tickets but got bad seats high up, so it didn't rain at all then). The Hothouse Flowers couldn't win under those circumstances. They tried, but the audience was trying to get not as wet as they already were. 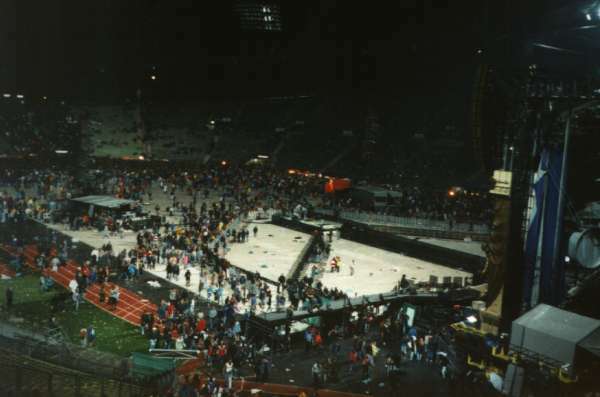 After some more warnings about the show possibly being interrupted due to extreme weather conditions and the promise, that the full show would be played, the Stones came on around 8.40 pm (maybel as in Wembley). Richards wore some outrageos green shoes, Jagger wore a hat a lot of the time, Even Ronnie did wear one when it got raining really heavily. The rain didn't stop the show, but we could see some outrageos stage wear by Jagger (that one coat with the fur round the collar was brilliant), no glimmer jacket for OOC, but a leather jacket & hat. 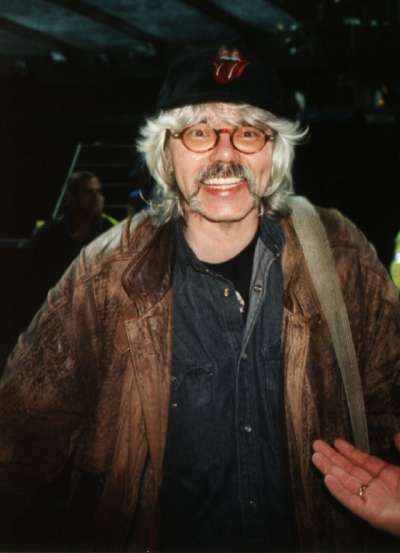 Keith had a sergeant's jacket from the dutch army he wore for his songs and during the end bit and Charlie even wore a rain jacket, when he had to cross the bridge. 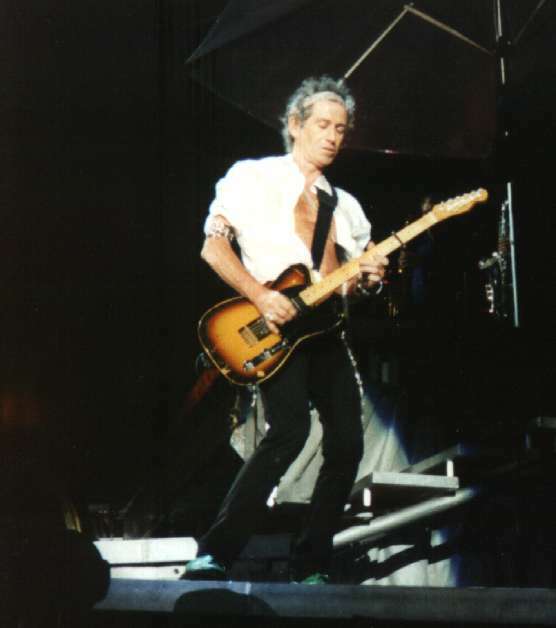 The show was good, but not brilliant, Jagger missed his bit in Tumbling Dice, Keith had to save that song and Love is strong (web choice) was another rehearsal version. they seemed to play it safe as well last night. During Miss You Jagger dared to kiss Lisa's inner thighs, but she was still laughing about him. It was good to see that right in front of you this time, but all in all, you can see more and better on Ronnie's side. There's more eople over there on stage than on Keith' side. You do hear much more of Keith on his side, though. Best bit: the ending of Wanna Hold you, where the guitars where really battling, great version. 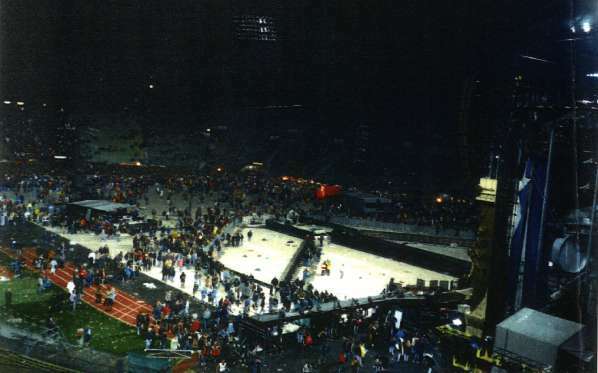 Odd bit: Jagger coming on stage for Sympathy (fromt he catwalk). He gave Ronnie a strange look about not playing correctly or not at all. Ronnie got eye contact with Keith and complained about Jagger's complaint. Keith tried to calm Ronnie down, who seemed pretty upset, because he was not supposed to play at all, as this was BEFORE the guitars set in. The guitarists then went to Charlie's drums and planned for revenge: When going over to the chorus, all three hit an offbeat note, that had Jagger looking back in amazement and everybody was laughing again. 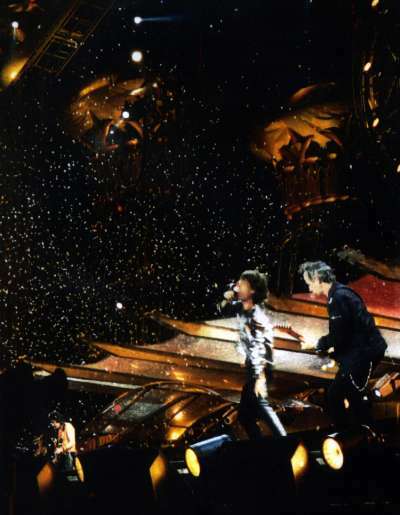 Other strange bit: Jagger going out on the catwalk again for "Brown Sugar" and Charlie alone on the stagefront, going left and right and thanking the crowd with the other three in the back. Mind: I bet Charlie now likes what he does and on the next tour we see him do his own solo bit as well. There's Bernard, who can sing, we have a piano and there's brass as well, so let's all vote for a Charlie solo song, ok? 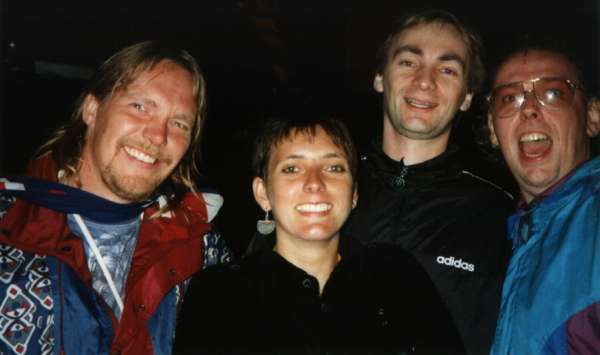 Axel, Birgit and Dirk came to that gate as well, but they came 40 minutes after me and it was crowded then. So we all met in Keith's side. 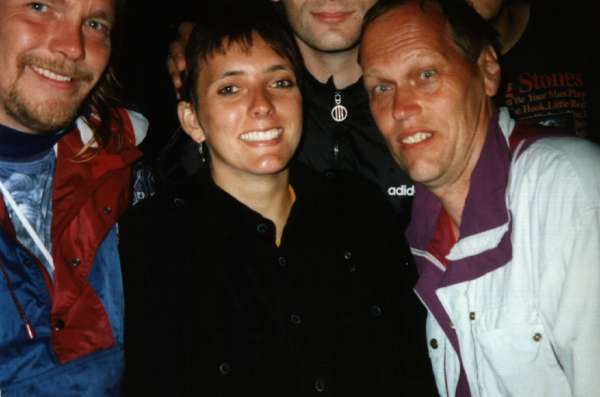 Birgit was overwhelmed to be in front row again as she had that about 20 times in 1990, together with Dieter Hoffmann (and you can see her in the opening shots of Start Me Up in "At the Max" as well). Nico was still in his office in Berlin, taking a late flight in, when we were at the gates. I think that was the first show where we all found out how useful mobile phones can be. He arrived during the Hothouse Flowers and we got him into the front section well before the show. Gerd was with us as well and Werner Dwenger (from Stoneware) was a couple of rows behind us, for obvious reasons. The show was not that good like the other two before, due to the rain, but spirits were high, so I enjoyed it a lot. 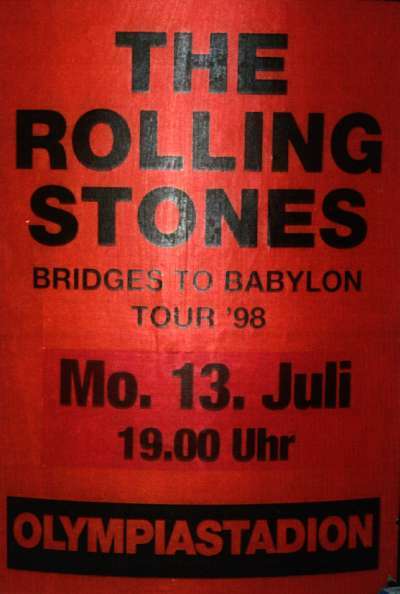 It was a shame that we were all staying at different places, so we split up after the show, Birgit and Dirk going back home on the motorway, Werner taking the train to Hamburg, Axel and Gerd staying with Hans and Nico and me going to our hotels. I did walk round Munich the next morning, as I had the afternoon flight booked for leaving, but did not meet anyone from the Stones. I think they had left early or were still in bed by that time. Axel did bring his camera this time, so we have got some pics from there. what other people said about the show.